Most of the following announcement will not immediately affect those who are not C++ standards committee members, but I hope everyone reading this blog who uses and relies on C++ will benefit from this new program. I’m pleased to share that today at the ISO C++ meeting in Lenexa, Kansas, USA, the Standard C++ Foundation launched a new financial assistance policy intended to facilitate the work of WG21. You can find the policy here. 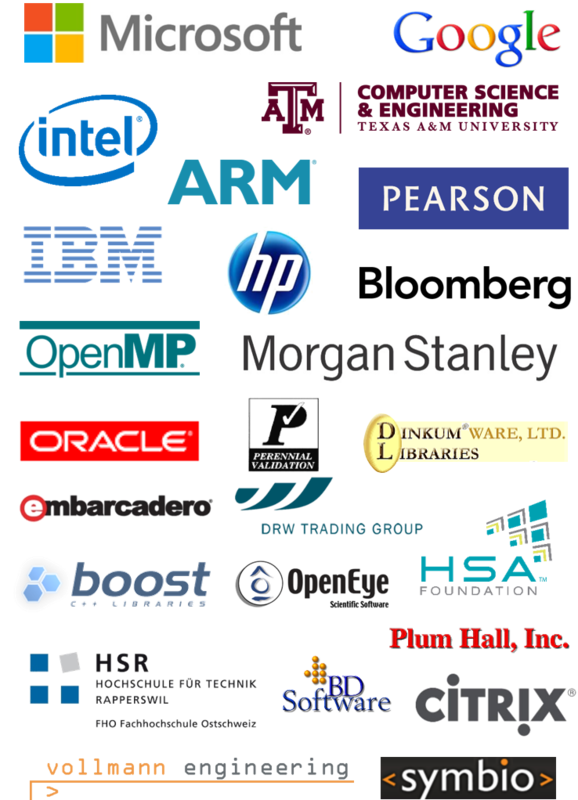 Thank you to the members of the Standard C++ Foundation whose logos you see at right. Their financial investment in the Foundation has provided the core funding to support the Foundation’s work since its creation in November 2012. Thank you to you, if you’re one of the hundreds who attended CppCon last September and/or one of the scores of volunteers who organized CppCon as a community C++ festival. The primary goal of CppCon was to deliver important information to the community, and so we kept ticket prices low to encourage attendance, we invested in recording all sessions to make them freely available to everyone... and thanks to the strong attendance response and all the volunteering help we got, we still managed to run at a modest profit that we can use both to run CppCon again (registration opens soon, watch this space!) and to invest back into the C++ community including through this new policy. Remember that the Foundation is not the committee, even though many people and companies participate in both. Rather, the Foundation exists to support the community and the work of the committee while leaving standardization strictly under the C++ committee leadership’s direction. For that reason, this policy leaves it up to the C++ committee leadership as to how the financial support should best be applied. Also, please note that this policy is experimental and subject to revision or withdrawal, but we hope it will be successful in facilitating the work of the committee as we develop the TSes, C++17, and beyond. Meeting hosting, when not enough financial support is available. Travel to a meeting, for authors of important proposals who are not employed by a company and not able to fund it on their own. Further development of proposals, again when the authors are not employed by a company and not able to self-fund the work fully. Note that both #2 and #3 are intended to directly help and foster community involvement beyond the big commercial corporations and academic/research institutions. Recall: For much of the history of the C++ committee, we have had key participants who have made an enormous difference to C++ who have not been funded by a company, university, research lab, or other organization. Today, that hasn't changed: We continue to have some of our major proposals, including at least three large proposed libraries including Ranges (range-based STL using concepts), Networking (based on Boost.ASIO), and 2D Graphics (based on Cairo), that rely partly or entirely on the efforts of such individual world-class experts, and that have been developed to their current state by those experts’ unpaid volunteer efforts. The committee has expressed strong interest in pursuing all of the three proposals I've just named, as well as others. However, nothing gets done unless someone can contribute sustained heavy work -- and because these key efforts are not funded by companies, some of these efforts likely cannot continue, and cannot be completed, without at least some assistance of the financial variety. We hope that the Foundation can help by starting to offer tactical travel assistance and grant funding for some of the costs of some of these kinds of contributors, so that we can help foster the work that the committee has declared an interest in, but that cannot progress without requiring some level of actual financial development assistance that would not happen if we relied on companies and other institutions alone. Since the last November’s standards meeting in particular, the Foundation directors have been working on putting together this policy because the Foundation had already become involved in supporting all three of these categories of standards-related work, but it has been in ad-hoc and on-demand ways as situations have arisen. For example, even before there was a policy, the Foundation funded work from which the standardization effort is already benefiting at this week's meeting: Without the first grant issued as an initial one-off grant over the winter even before this regular policy became official, we would not now have a 170-page document before us containing near-complete working draft text for applying concepts and ranges to the entire STL iterators and algorithms libraries, along with an open source reference implementation on GitHub – and we do have that and are considering it at this week’s standards meeting. Since this has worked very well in the form of ad-hoc one-off support, the Foundation directors decided it was time to establish a structure to formalize and regularize this support, and test how well it works more broadly. Again, this is experimental and subject to review based on how it goes. As we try this out together with the committee subgroup chairs between now and our next meeting in October, we’ll get a better feel together for how it will all work in practice. Thank you again to the Standard C++ Foundation members at right who directly financially support the work of the Foundation including this initiative. Thank you again to the CppCon attendees, and to the CppCon volunteers who contribute so much to the running of that conference to disseminate information and support the C++ community, because your support for CppCon feeds back into enabling things like this initiative. Thank you again to the C++ committee members and leadership who work hard year after year to bring us modern Standard C++ at high quality. Thank you all, dear readers, for all you do for Standard C++. The Foundation is glad to be able to try to provide some financial support for the good work of C++ standardization in key areas to promote the development of our Technical Specifications, C++17, and beyond, and we look forward with intense interest to see what future results these and other efforts may bring. Herb IDK if you are just being shy or you dont accept donations from individuals but if you do please add the info. I wont be giving you thousands or millions but I am very thankful to individuals like E Niebler that gave up >100k USD in earnings that they could have made working for a salary instead of doing pro bono ISO work. @NoSenseEtAl: Thanks for the offer, it's much appreciated. Even more so, thanks for your expression of appreciation for individuals' pro bono efforts for standardization -- I'm sure it means a lot to them as they read this! In brief, the Foundation isn't set up to accept individual contributions because of the kind of U.S. nonprofit that it is -- it's a 501(c)(6), not a 501(c)(3). The highlights are that membership is for companies, and contributions are not deductible as charitable donations. If you have a small company of your own, such as because you're a contractor or consultant, your company can become a member of the Foundation and be recognized on our member list -- several of our members are small companies. If you don't, you can always feel free to reach out to individuals you know are doing good work and I know they'd appreciate hearing from you.